The PC-100 Universal Protocol Converter/ Code Translator is a microprocessor controlled protocol converter designed to convert an incoming PTZ camera motion code to a different format and retransmit it out a second port. 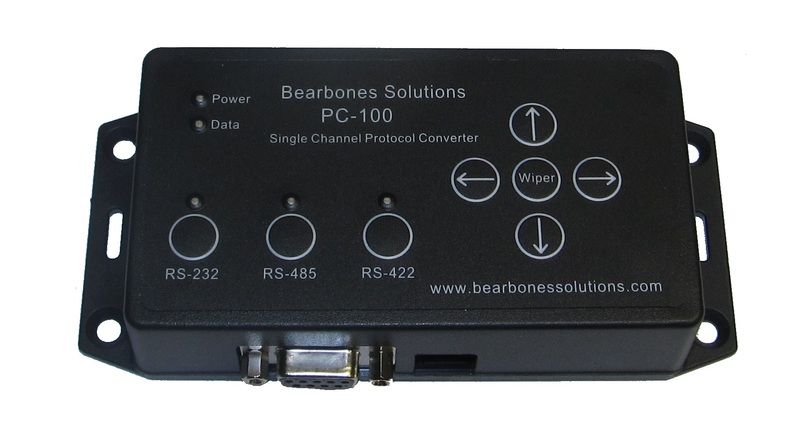 The PC-100 supports RS-485, RS-422 and RS-232 inputs and an RS-422/RS-485 output. The front access buttons make the unit easy to test in the field without a controller and wiper enabled cameras can be activated for easy maintenance cleaning. COM 1 is the Camera RS-422 interface and a second COM 2 for RS-485 or RS-422 which are user selectable using the face side buttons. The PC-100 has a wide input power range from 8-28V A/C or D/C. Each comes with a removable screw terminal plug block. 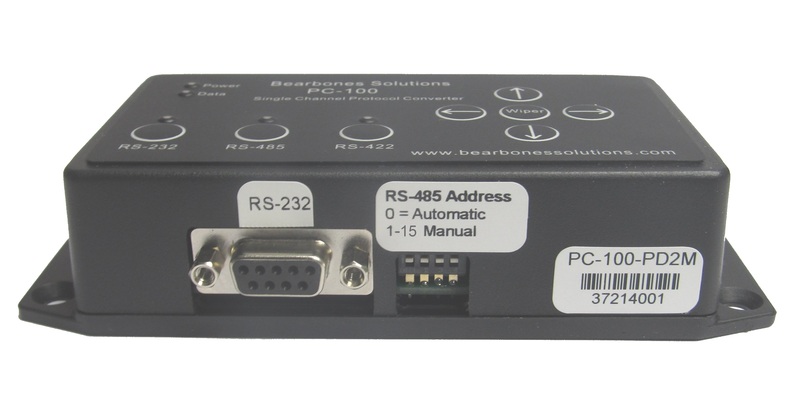 An RS-232 port is offered for direct to PC interfacing or to a RS-232 enabled data transceiver. Addressing can be set manually or if left at 0 it can be set dynamically by the Console program. The PC-100 offers 5 buttons for field testing or maintenance of the CIT-7310 PTZ camera. UP, DOWN, LEFT, RIGHT and WIPER. These allow for quick communications testing between the PC-100 and the camera and the wiper button would be a great maintenance tool for field technicians. 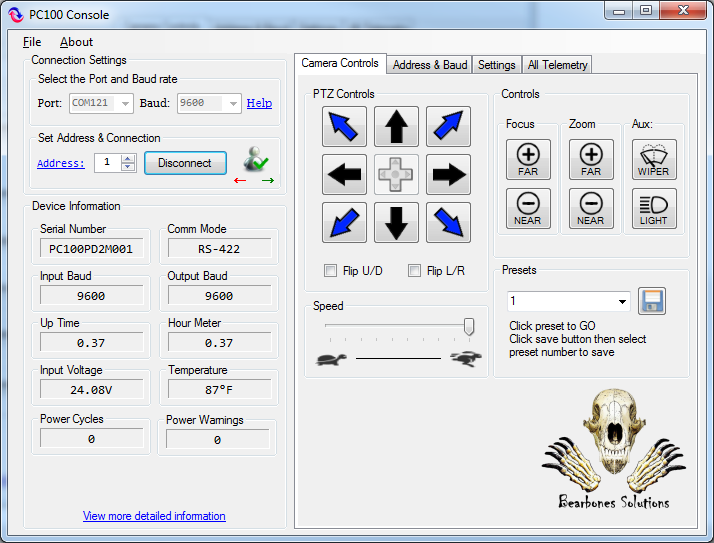 PC-100 Console is a Windows based program for configuring and monitoring the PC-100. The PC100 Console program allows the communications method and baud rates to be configured over any of the available input interfaces. The PC100 address can be configured up to 251 by using the console program and the DIP switch set to address 0. The console has a feature to “Beep” a specific PC100 which sends a command to run the audible beeper to allow the unit to be discovered where it’s exact location may not be know. Viewing of the power, input voltage, temperature and reset statistics can help diagnose issues with field power or temperature issues. These values can be reset by the user at any time using the PC100 Console. A list of available protocols is provided below. New protocols are being added to the list and if you don’t see the one you need please contact us and if we don’t have it we may be able to develop it for you. The protocols below may not have the full range of control available to specific cameras but all have the basic PTZ controls. Shipping to the USA will be through USPS Parcel Post. Shipping cost is calculated by location. If you have a UPS or FedEx shipping account please contact us before purchasing and we will send you a special invoice. Please contact us before placing an international order. We ship to a limited number of countries and shipping rates have to be calculated on a case by case basis. NOTE: Lead times may apply. 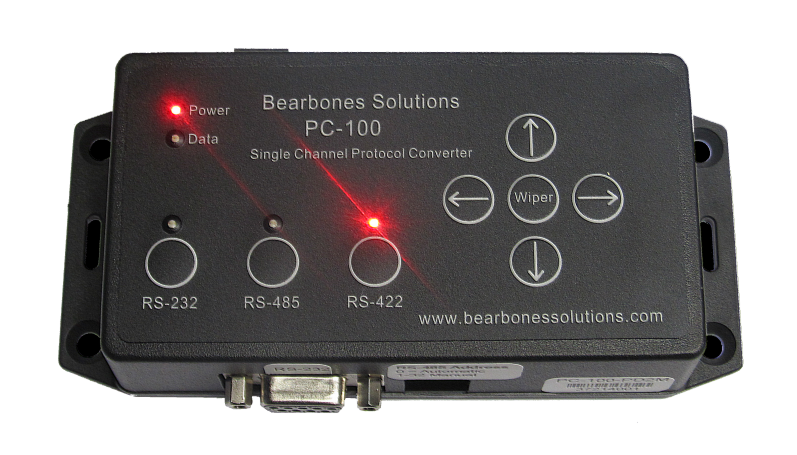 Please contact sales@bearbonessolutions.com for more information.